Bank of Montana has helped a number of customers learn about, and benefit from, Montana Board of Investments (MBOI) loans and Small Business Administration (SBA) loans. Build your future with Bank of Montana. Are you looking for enhanced financing options? Bank of Montana has worked with the Montana Board of Investments and our customers, both big and small, to help expand and further develop their businesses. Bank of Montana and its staff have spearheaded the origination of more MBOI Commercial loans than any other institution in the history of the program. These Montana business loans offer many benefits to the customer including potential rate reductions for eligible jobs creation and long-term fixed rate financing. We love entrepreneurs. They are the lifeblood of Montana’s economy. And as a business bank, we specialize in helping entrepreneurs grow their businesses or start new ones. What’s more, as entrepreneurs ourselves, we know that all small businesses have unique banking needs. Bank of Montana works with the Small Business Administration to offer custom loan solutions for your small business. To learn more about these financing options, please contact on of our loan officers today! Partnering with Bank of Montana was like a breath of fresh air in the world of business and finance. They bent over backwards to find solutions for our complex, multifaceted project. Tim and Suzy founded the Kettlehouse Brewing Company in 1995 as a brew-on-location establishment where the public could use the Kettlehouse’s equipment and recipes to brew their own beer. The Kettlehouse has since become a nationally renowned microbrewery and taproom. It currently produces 24 variations of craft beers and essentially revolutionized the microbrewery industry by canning their beers, making the industry more sustainable and environmentally friendly. Revolutionizing the micro-brewery industry was great for the Kettlehouse’s bottom line, and eventually meant that the company needed more space to keep up with demand. 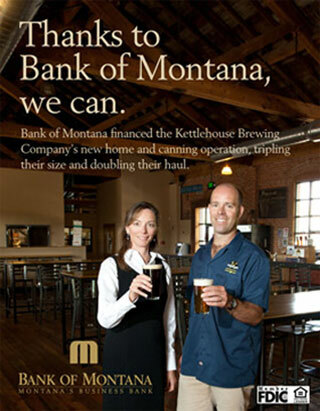 In 2009, after Bank of Montana worked to understand and help solve the Kettlehouse’s intricate financing challenges, the company purchased a larger facility and expanded to a new location. Bank of Montana’s solution was a creative finance structure involving the U.S. Small Business Administration program to help close the deal. Missoula’s old Pac-West building tripled the size of their space, with a cooling cellar, elevator, loading docks – exactly what they needed to grow. The innovative cannery spurred rapid growth, and Bank of Montana was an ideal partner for creative businesspeople like Tim and Suzy to help them achieve their goals.